King William St again. 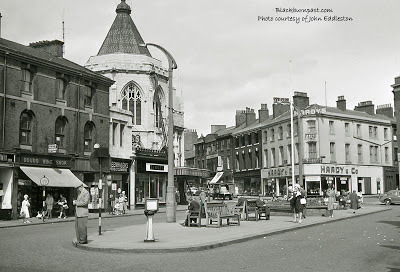 This time towards the north end, by the old Town Hall (out of view to the right). Hardy & Co, now the Royal Bank of Scotland on the corner of Museum St were furniture dealers I believe. I've got both of the books, but the photos are nowhere near as clear as this - a result of the printing tecnhique/ technology used I presume. I'd love the book to be republished with these higher resolution photos. They're so valuable to the town's history. I'm glad you've said that Lorcan. I'm tired of seeing rubbish scans on the 'net' of John Eddleston's photos (and as mentioned, often uncredited to him). Like you say, the books weren't the best quality, but then when they're roughly scanned (sometimes crookedly and with parts of the image cropped off) by folks, only keen to hurriedly upload them to various Facebook groups and / or Flickr for their mates, the quality deteriorates further. Some scans I've seen are an insult to the man's ability as a photographer. Quite a lot of the original slides (which these are copied from) had specs of dust on and other marks and smudges. But with the aid of Photoshop 7, I'm cleaning them up a little before uploading them. I'm taking care not to alter or enhance the image, but just erasing the dots / stains etc that obviously aren't meant to be there. Well where I can anyway. I think I have most, if not all, of the photos that appeared in the two books, so hopefully over time (quite some time), I'll add them all.